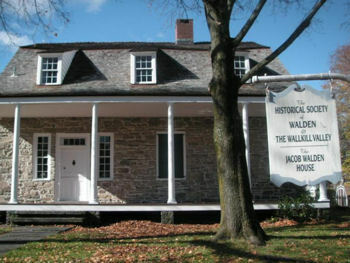 The Jacob T. Walden House is the home of the Historical Society of Walden and the Wallkill Valley, located in Walden, New York. The historic house dates back to the 1760s. The Historical Society of Walden and the Wallkill Valley is pleased to host our new blog (being launched in NY during historic Hurricane Sandy)! We will post questions and comments we receive at the Historical Society and invite you to comment or respond with any information you would care to provide on the topic. Our Society holds monthly public meetings with guest speakers and programs throughout the year on the 3rd Wednesday evening of March, April, May, June, September, November, December –and are free. This year we are pleased to be hosting a Special Tribute to our Veterans on Sunday, November 18th from 1-4 at the Jacob T. Walden House. The historic Jacob T. Walden House is the home of our Society and is located at 34 North Montgomery Street in Walden, N.Y. Each year we hold special programs that include the Annual Walden Local History Day, The Annual Spring Tea, Picnic on the Porch, Annual Yard Sale, and the Annual Christmas Tea Open House. Please see our calendar at www.thejacobwaldenhouse.org for upcoming specific events and dates. The Walden House is an example of Hudson Valley Dutch colonial architecture built, we think, before 1768. It is constructed of cut stone and has walls about 2 feet thick which is indicated by the depth of the window sills. The house is situated on land that was originally part of the Gatehouse Patent. It is believed that Samuel Erwin and his heirs enlarged the original home by adding this stone structure to a smaller frame house that no longer exists. In 1813 a wealthy New York City shipping merchant named Jacob Treadwell Walden purchased the home from the heirs of Samuel Erwin and moved his family here. He also purchased many plots of land near the Falls along the Wallkill River. When Jacob Walden arrived, the area was known as “Kidd Town” so named for the Alexander Kidd families who settled here in 1736. Upon Jacob Walden’s death, the town was renamed “Walden,” in his honor in 1855. The Historical Society of Walden and the Wallkill Valley owns and maintains the historic home that Mr. Walden referred to as “Old Hearthstone.” It is furnished as we feel Mr. Walden and his family might have during their occupancy, however, none of the furnishings on display today belonged to the Walden Family. You are invited to join us for any event–or here on our blog. Your input and comments are welcome! According to information I collected two years ago at the Orange County Historical Society in Goshen, my ancestor, Thomas Mitchell Fullerton, sold 128 acres located in the Gatehouse patent to Jacob T. Walden of New York City in 1813 for $5,219. It was part of a tract of 202.4 acres purchased by Fullerton in 1807 from William and Ann Erwin. It appears, although I have not checked for a survey, to be the land surrounding the so-called Walden house, which must have been on the property at that time. Can you tell me whether this information is accurate? Does it appear that Walden did not purchase that particular tract directly from the Erwin family? If not, can you tell me which nearby house or land was purchased by Walden from Fullerton? My great-great-grandfather recalled with pleasure a portion of his boyhood spent in a house overlooking the Wallkill. Thank you for your message. Shared your message with our Trustees and hope to have some info for you soon.